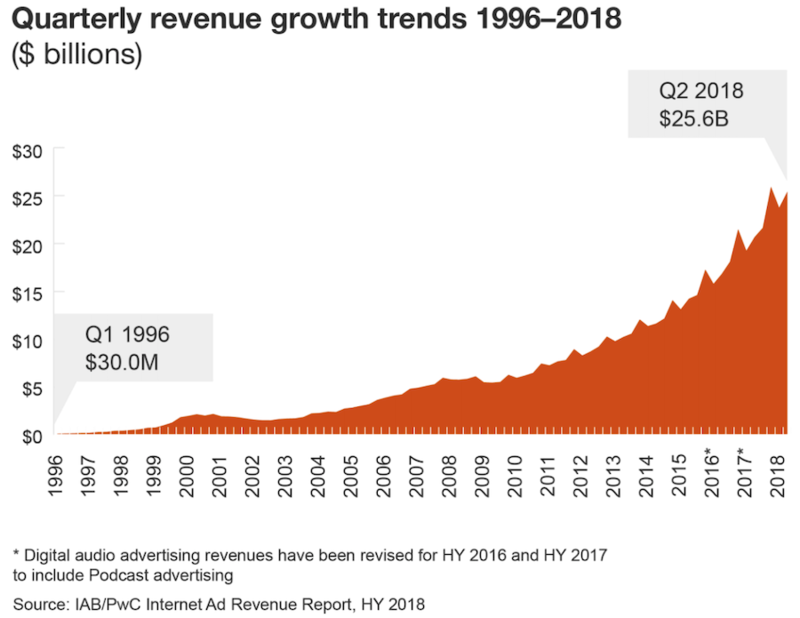 The IAB released a new report produced by PwC showing that U.S. digital advertising revenue in the first six months of 2018 totaled $49.5 billion. The record high is a spike of 23% over the year-ago period. Digital audio advertising revenue for the half reached $935 million. This puts the segment on track to exceed the 2017 annual total of $1.8 billion in revenue. The report also demonstrated high interest in mobile, which generated 63% of all digital ad revenue in the period. Advertisers spent $30.9 billion on mobile media during the first six months of 2018, rising 42% from the same period in 2017. Mobile was responsible of 73% of audio digital advertising, rising 32% on-year.